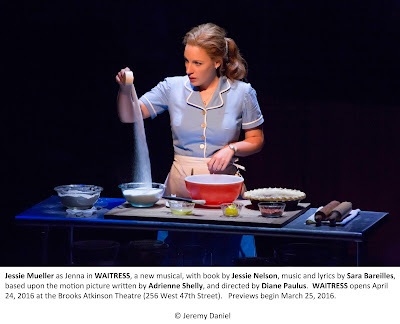 The endearing new Broadway musical Waitress, based on Adrienne Shelly’s film and featuring a score by pop singer/song writer Sara Bareilles, serves up a satisfying helping of just what I have been asking for: a show featuring women on stage dealing with women’s issues. The show is written by women featuring a number of women characters dealing with issues common to many women. So if one more person refers to this show as “chick flick,” I might be tempted to hit them in the face with a pie. There are plenty of them to be had in this production as two cases tower either side of the proscenium in Scott Pask’s set transforming the Brooks Atkinson Theatre into a pie-serving diner where ushers dressed like waitresses sell snack cups with pie during intermission when the smells of mouth-watering baking pour into the house. The ambiance invites us to take up a stool at Joe’s Pie Diner where Jenna (Jessie Mueller, who won a Tony for her moving portrayal of Carole King in Beautiful) finds solace in creating pies. The working of the dough and creativity of finding just the right blend of flavors give her an outlet to express her emotions and the activity brings her comfort as she remembers learning the craft from her mother. The pies reflect what she is experiencing in life and are given names like “Couch Potato Pie,” “Humble Crumble Rhubarb,” “Mama’s Lavender Lullaby” or "Up a Stream Without a Banana Cream.” If they don’t all sound happy, that’s because Jenna’s life isn’t. Husband Earl (Nick Cordero) is no longer the man of her teenage dreams. He is pretty useless, really, except when demanding Jenna’s hard-earned tip money. “How’d we do today?” he asks, even as his hot temper causes him to lose his job. Right about here, I wanted to strike him with a rolling pin (this can’t be a fun role for Cordero to play night after night). 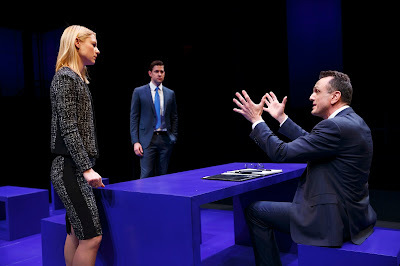 He drinks a lot and we get the impression (through some of Diane Paulus’ direction) that he might be physically abusive, though this is not depicted on stage. Her waitress friends at the diner, Dawn (Kimiko Glenn) and Becky (a delightful Keala Settle), hide her condition from Earl and their boss, Cal (Eric Anderson), until she figures out what to do. Finally, Jenna decides to save up to enter a baking contest and use the prize money to leave Earl. The friend characters don’t get a lot of development, but what is there is interesting. Wisecracking Becky, whose husband is ill, finds unexpected companionship with crusty Cal who normally serves as her verbal sparring partner. Shy, insecure Dawn finds dating success with enthusiastic and humorously persistent Ogie (Christopher Fitzgerald). Jenna might even get a second chance at love with handsome Doctor Pomatter (Drew Gehling), though there is a lack of visible spark between the actors to convince us of this. Though the pie names and some of their ingredients aren’t exactly appetizing, the book by Jessie Nelson (known for her screenplays for “I Am Sam,” “Stepmom” and “The Story of Us”) provides a slice of life to which many women can relate (Lorin Latarro’s choreography adds to the storytelling). We’ve either tasted this pie filling or know someone close who has and Bareilles’ music and lyrics are the cherry on top. The ballad “She Used to Be Mine” had me leaning in to hear every word of the lyrics, not only because the sentiment was wise and genuine and seemed to be speaking to my heart, but because Mueller can be difficult to hear at times (I don’t think it is the fault of Sound Designer Jonathan Deans; it seems to be Mueller’s enunciation.) Listen to a clip below. Waitress and its really pleasing score are a winner, I am in love with a recurring few lyrics sung about sugar, butter and flour that are a mixture of love and hope shared among the generations of bakers. Music Supervision and Arrangements are by Nadia DiGiallonardo; Orchestrations are by Bareilles and the Waitress Band. Diner owner Joe (Dakin Matthews) offers a wonderful example of how one person can make a difference in someone’s life. 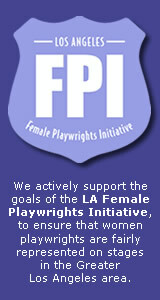 So if a show written and directed by women about women for women is considered “chick flick,” then I suppose that means stories written and directed by men about men for men -- that would most of what we see on stage these days -- should be labeled “prick flicks.” Serving up some “I Dare You” pie. 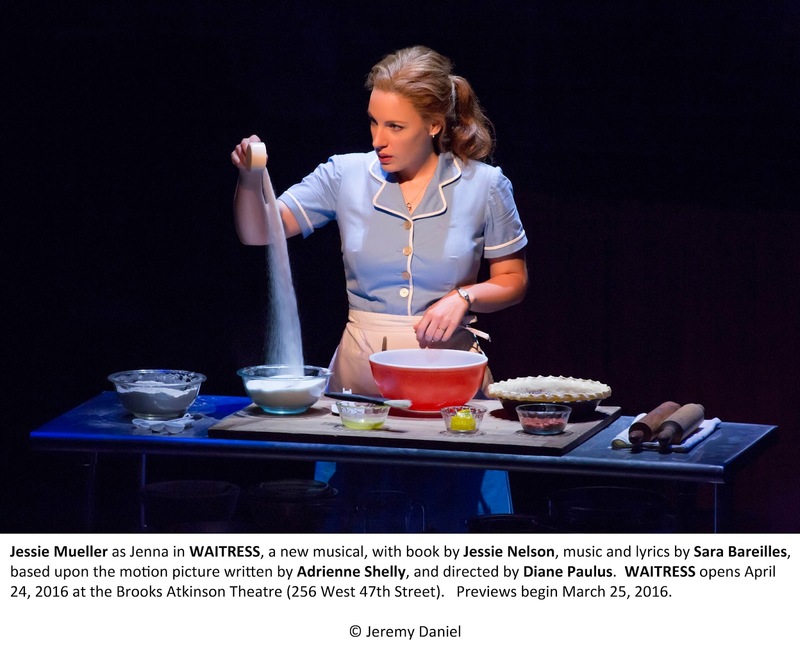 Waitress takes your order at the Brooks Atkinson Theatre, 256 West 47th St., NYC. Performances are Tuesday Wednesday, Thursday at 7:30 pm; Friday and Saturday at 8 pm; Wednesday and Saturday at 2 pm; Sunday at 3 pm. Tickets are $59 - $145: (877) 250-2929; waitressthemusical.com. 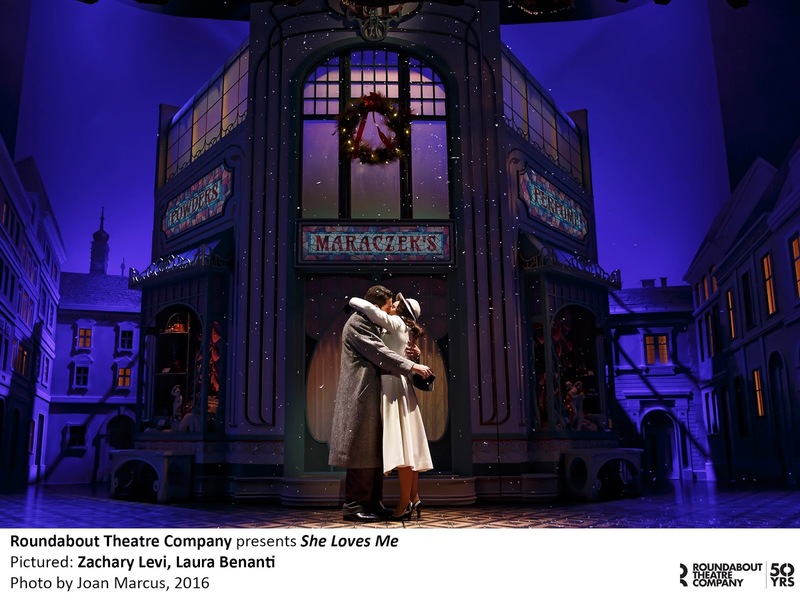 Associate Direction by Nancy Harrington, Associate Choreography by Abbey O’Brien, Costume Design by Suttirat Anne Larlarb, Hair Design by Rachel Padula Shufelt and Jason Allen. Lighting Design by Christopher Akerlind. Billie Joe Armstrong, These Paper Bullets! Outstanding Projection Design Nicholas Hussong, These Paper Bullets! The Humans – Special Drama Desk Award for Outstanding Ensemble Cassie Beck, Reed Birney, Jayne Houdyshell, Lauren Klein, Arian Moayed, and Sarah Steele spend a very special Thanksgiving Day together in Stephen Karam’s play, reminding us that home is indeed where The Humans are. The Royale – Special Drama Desk Award for Outstanding Ensemble The heavyweight cast of McKinley Belcher III, Khris Davis, Montego Glover, John Lavelle, and Clarke Peters gels as a unit in bringing Marco Ramirez’s story, inspired by Jack Johnson, to unforgettable life, offering a trenchant statement on racism in America. 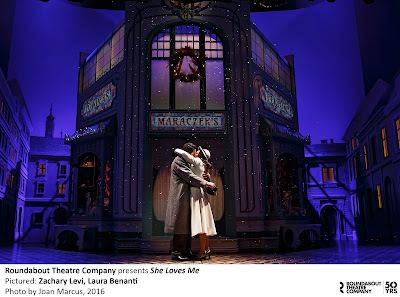 Sheldon Harnick – Special Drama Desk Award New productions of Fiddler on the Roof, Rothschild and Sons, and She Loves Me this season remind us that this veteran lyricist’s takes on faith, family and community are as resonant as ever. 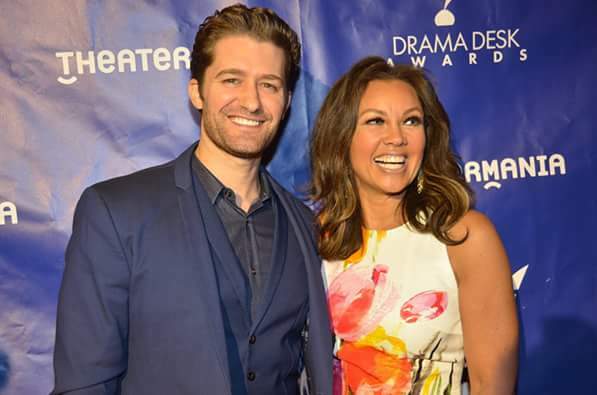 Camp Broadway – Special Drama Desk Award For more than 20 years, this indispensable organization has introduced young people to the magic of theater. 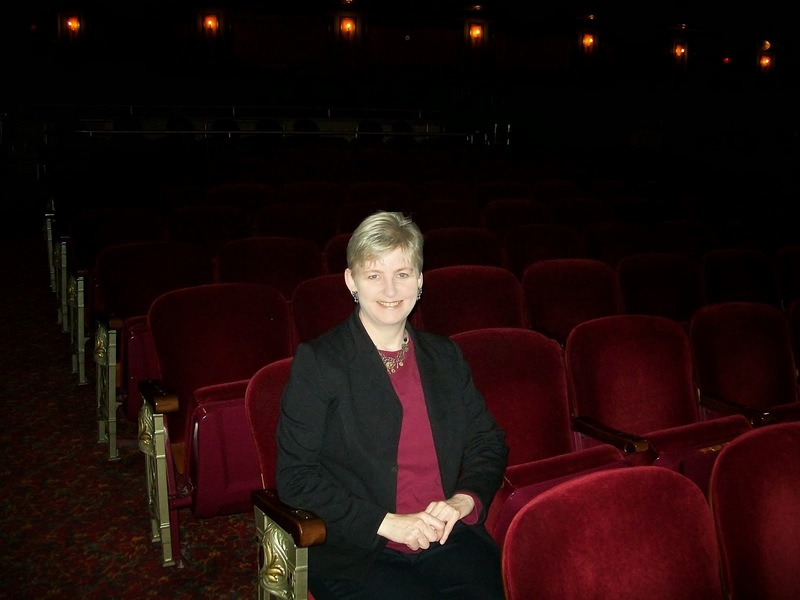 Camp Broadway plays a crucial role in creating tomorrow’s audiences. Danai Gurira – Sam Norkin Award Whether writing about women in wartime Liberia in Eclipsed or about an affluent immigrant family from Zimbabwe struggling with assimilation in Familiar, Danai Gurira demonstrates great insight, range, and depth, bringing a fresh new voice to American theater. High finance, greed, integrity, ambition and loyalty, all rolled into a wad of priceless humor. Normally dialogue about mergers, corporate buy-outs, limited partners and sourcing jobs out of the US probably would cause our eyes to glaze over as we try to follow the plot, but in the skilled hands of playwright Sarah Burgess, Dry Powder (a recipient of the Laurents/Hatcher Foundation Award and a finalist for the Blackburn Prize) is a compelling 95-minute study of modern business dealings and their effects on the people who orchestrate them -- and on the country as a whole as we tolerate them. Hank Azaria (most known for his work on The Simpsons) is Rick, the senior founding partner of a top-tier financial management firm in New York that has been weathering some really bad press lately. It seems the American pubic (and people world-wide, for that matter) didn't react well when he and his fiance through a million-dollar engagement party complete with elephants just after the firm took over a national grocery store chain and put lots of people out of work. High-strung, workaholic, numbers-crunching Jenny ("Homeland's" Claire Danes) assures Rick the hatred will blow over. The third partner, Seth (John Krasinski of TV's "The Office") isn't so sure. He had advised the boss to call the party off. And it looks like he was right. He always is, after all, he would tell you, when he and Jenny disagree. which is always -- that is why Rick chose them, so he can hear all sides before making a decision. Meanwhile, Seth brings the partners a super deal that might turn things around for the company. CEO Jeff Schrader (Sanjit DeSilva) is willing to sell his luggage firm at a really unbeatable price, and Seth has plans to expand it by introducing a new line of customizable luggage. Jeff sees a way to cash out his aging owner and get a cushy job and bonus out of the deal for himself to finance the failing side business he and his wife started. There's just one catch. Seth has promised during the negotiations that none of the company's employees will lose their jobs and Jeff is holding him to that. Rick might have other plans, though. 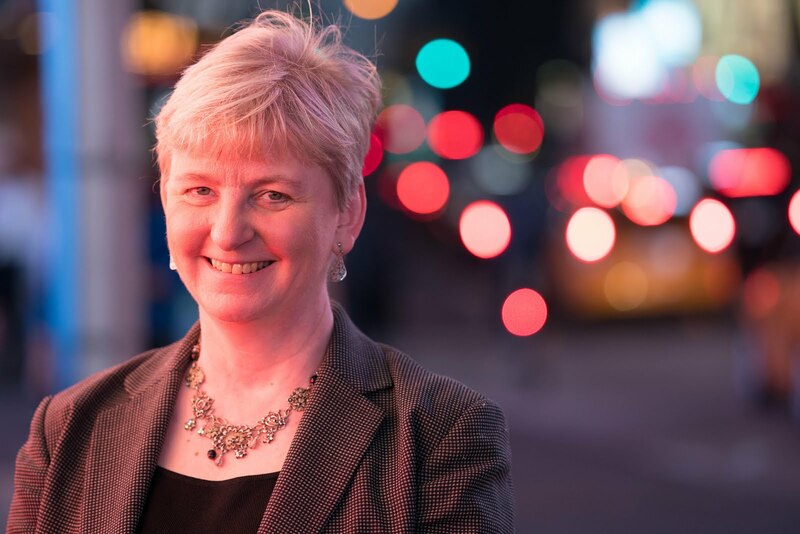 When Jenny gets her analysts crunching numbers she finds that stripping the bleeding luggage company of assets and employees and refocusing production overseas might prove a higher return on the partners' fund investment. Just how far are these folks willing to go --and what level of deceit is acceptable to use when you are looking out for Number 1? Easily one of the best plays of the season. Taut direction by Thomas Kail, a stark, cool minimal set by Rachel Hauck to depict the souls of these folks, Original Music and Sound Design by Lindsay Jones and Costume Design by Clint Ramos all merge for the perfect Wall Street backdrop. The performances are stellar, from the bickering, insulting colleagues -- Seth gripped by the remnants of a conscience long ago abandoned by his partners and Jenny annoyingly shaking her head to emphasize every word hurled at Jeff, and confirming her matter-of-fact admission that her analysts "don't love me -- that's how you know their numbers are true." Azaria finds balance between a personality that appeals to people willing to part with large amounts of money to invest in his schemes, inspires his employees to go to any length for him while communicating a sincere lack of caring about anything or anyone in the end. DeSilva provides a softer, more likable character as contrast to the cut-throat atmosphere generated by Jenny and Seth, but not all is as it seems there either. None. Thoroughly entertaining. Well written. Dry Powder runs through May 1 at The Public Theater, 425 Lafayette St., NYC. publictheater.org/en/Tickets. Gossip, gossip and more gossip. Mark Linn-Baker and Dana Ivey star in Richard Brinsley Sheridan's late 18th -century farce in the vein of Moliere. Several plots unfold and entwine. Sir Oliver Surface (Henry Stram) returns home after a longtime abroad to test the character of his two nephews, Charles (Christian Demaris) and Joseph (Christian Conn) to see if they are worthy to be his heirs. Meanwhile, Lady Sneerwell (Frances Barber), a widow interested in Joseph, starts some gossip when she discovers he is interested in Maria (Nadine Malouf) ward of Sir Peter Teazle (Linn-Baker) and suggests that Teazle's wife (Helen Cespedes) is herself involved with Charles. Helping her circulate rumors are gossip columnist and critic Mr. Snake (Jacob Dresch), Sir Benjamin Backbite (Ryan Garbayo ), who is a gossip with poetic flare, and Mrs. Candour (Ivey). who deplores gossiping while proving herself a champion at it. The Teazles try to work their way through an unsuited marriage and Sir Oliver, with the help of friend Master Ranji (Ramsey Faragalah), tries to discover the true character of Joseh and Charles. This is a classy, entertaining revival. Linn-Baker is the perfect straight man, enhancing the humorous chaos taking place around him. Costumes by Andrea Lauer enhance the characters -- from elegant and stylish to vulgar (with period Hair and Wig Design by Charels G. LaPointe. Scenic Design by Anna Louizos, Music and Sound by Greg Pliska and Choreography by Paul McGill complete the silly picture. I found the pace in the almost two-and-a half-hour run (with one intermission) a bit draggy. The School for Scandal runs through May 8 at the Lucille Lortel Theatre, 121 Christopher St., NYC. Tickets are $80-$100 www.redbulltheater.com; 212-352-3101. -- No content notes. Enjoy. Some people, fueled by hatred, tell lies about others, threatening their livelihood and perhaps even their lives. A story ripped from today’s headlines about racial tension in Ferguson, MO, terrorist threats amidst refugees crossing borders or Christians refusing to obey laws that violate their beliefs? No – it’s the plot of Arthur Miller’s play The Crucible about hysteria during the Salem witch trials getting a spellbinding revival directed by Ivo Van Hove on Broadway. The message could apply to any of those more contemporary issues filling our culture with hate, however, so fresh and raw is the presentation. Award-winning film actress Saoirse Ronan is a chilling Abigail Williams, a young girl who seeks revenge on John Proctor (Ben Whishaw) who, guilt-ridden after succumbing to her seduction, allows his godly wife, Elizabeth (Sophie Okonedo) , to turn the servant girl out of their home when she suspects something might be going on. Abigail enlists the help of other young girls, who may or may not have joined her in practicing some witchcraft. Betty Parris (Elizabeth Teeter) has been in a trance since the girls met and apparently danced naked in the woods, much to the horror of The Rev. Samuel Parris (Jason Butler Harner). Parris askes the Rev John Hale (Bill Camp) to come investigate. In the ensuing inquiry and trials which have scores arrested and on trial for their lives, the girls stick together in their story which implicates innocent townsfolk in witchcraft: Tituba (Jenny Jules), Rebecca Nurse (Brenda Wehle) and even elderly Giles Corey (Jim Norton). The madness if fueled when people like the Putnams (Thomas Jay Ryand and Tina Benko) start to wonder if losing many children at young ages might have been due to witchcraft and when Abigail refuses to stop her persecution and the other girls are too frightened to speak against her. One girl, the Proctors’ new maid, Mary Warren (Tavi Gevinson), tells the truth, but with disastrous results. After all, what does the truth matter when society has decided what you must think and say or lose your life? The brilliant direction includes setting the play in a school room (designed by Jan Versweyveld, who also designs the lighting) and dressing the girls in school uniforms (Costume Design is by Wojciech Dziedzic). The result is that we see a tale taking place in late 17th-century Salem, but which could be happening today. This, of course, was Miller’s intent, as the play was written in response to the anti-Communism hearings being conducted by the House Un-American Activities Committee led by Sen. Joseph McCarthy in the 1950s. The contemporary connection is so compelling that the pointing of a finger and screaming the word “witch” can be applied today as people point and scream “Christian!” or “Racist!” You either get on board with politically correct policies or find yourself ruined – and little care is given to the motivation of those doing the accusing. Fascinating in their modern application also, are messages about the church. 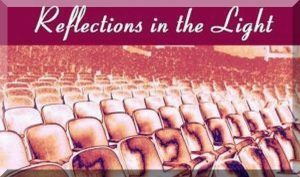 There are comments about people staying away from church because God is hardly mentioned there (a nod toward today’s churches who opt for popularity over preaching the Gospel). The 10 commandments are written on the blackboard, then obliterated as other things are written over them Video Design by Tal Yarden, in a nod to rewriting scripture when we don’t like what it says – and the silence required about it in our schools). The worst offenders are Judge Hawthorne (Teagle F. Bougere) who won’t listen to any version of the truth except the one he wants to hear and Hale, who realizes too late what is happening and then, because he didn’t do what is right in the first place, is impotent. 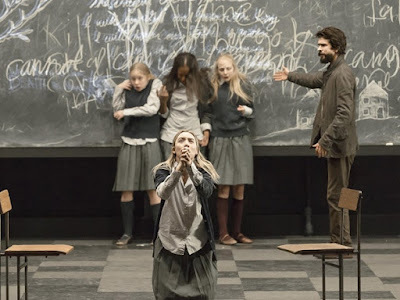 Though I have seen other versions of The Crucible and thought them good and timely, never before have I been blown out of my seat by the fright of seeing modern events depicted in such a dark and cunning way. The suggestion later, in very dramatic special-effect that devil worship might just behind all of this is particularly chilling and the Original Score by Philip Glass seals the feeling. 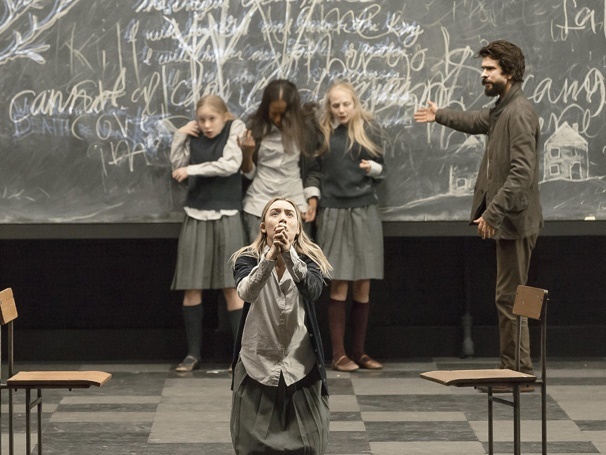 The Crucible casts its spell through July 17 at the Walter Kerr Theatre, 219 West 48th St., NYC. Performances are Tuesday and Thursday at 7 pm; Wednesday, Friday and Saturday at 8 pm; Wednesday and Saturday at 2 pm; Sunday at 3 pm. Tickets are $42-$149: thecrucibleonbroadway.com; (877) 250-2929. Sergio Trujillo On Your Feet! Kenneth Posner On Your Feet! Ana Villafañe On Your Feet! Andrea Burns On Your Feet!